The following virtual dialogue was composed from comments made to me by individuals who have read my White Paper on implementing medical tourism into workers’ compensation, or by individuals in a social media discussion group I participated in late last year. The point comments will primarily come from those who read the paper, and one individual in the group discussion. The counterpoint will come from me, and two other individuals in the group discussion, one of whom is a nurse who has her own medical tourism company, and provided a few of the point questions as well. Only about 1% of all workers’ compensation claims are catastrophic and these usually require high dollar emergent care. There is some room for controversy concerning follow on procedures and whether these need to be handled within the same clinical realm as the original or earlier procedures. This would only apply to non-emergent care, but it would depend also on how large that 1% of all workers’ compensation claims was. If we are talking about 1% of a 100 claims, then yes, that would be a small number of claims, but if we are talking about thousands of claims every year, 1% of that number would be considerable, and thus large enough to permit some claims to benefit from medical tourism. Workers’ comp tries to avoid paying for knee or other joint replacements except in the rare instance of traumatic injury requiring joint repair. The great majority of joint replacements are due to chronic, co-morbid conditions which are not work related and it is the job of a good workers’ comp TPA to deny coverage for these procedures. Much of the joint surgery performed with workers’ compensation claims are arthroscopic joint repair surgeries, which also is quite expensive, and would be natural procedures that medical tourism could offer at lower cost and the same or better quality that in the US. A. You have not looked at the cost of airfares, family participation and other costs attendant on overseas medical care. This is handled by medical tourism brokers or facilitators, who include airfare, accommodation of one other person and other costs. B. What about adding on the travel expenses (e.g. airfare, meals, including a family member’s hotel and related expenses? (I see you note that even with this added in, it’s still cheaper.) What if the claimant has small children and they’re suddenly being shipped away for treatment? What happens to the children and who pays for that? C. Regarding the provision of travel aid for loved ones, my experience is that job or family care demands of the loved one are as big a barrier to their traveling…To my knowledge no medical tourism program provides income replacement to replace income a spouse loses to travel abroad to be with a patient getting care through medical tourism. I would also note that this problem may be more manageable when a patient travels domestically away from home to get care but exists here too. All that it takes to test the theory that traveling for care undermines the availability of family support and presence is to visit patients getting care several hours from home whose visits from family are limited by these proximity and other demands of life challenges. These issues are only magnified when the care is provided abroad. As a result, the families that can attend a patient getting care abroad are usually those with more resources. A. That is the benefit of medical tourism, it is a package deal. You should learn more about it by checking into some of the medical tourism companies out there. B. The airfare, hotel and expenses are covered in the total cost. The basic package is generally the patient, one companion, airfare, hotel, and expenses. If you saw the hospitals I have seen online, they look like hotels, and even have rooms for the guest to stay in so that they are not far from the patient. These hospitals have food courts like shopping malls here in the US with all the major food groups, McDonalds, Burger King, Wendy’s, KFC, and even local fare, but if the patient is there for heart surgery, I would not think they’d let them eat that. You keep using the term “shipped away” as if traveling abroad is some kind of torture or punishment. Don’t you think that working people deserve to see a little bit of this planet of ours? Don’t you think that such travel will bring better understanding of foreign cultures and people, and will benefit both the patients and those who care for them? I think it is a great way to bridge the gap between the west and the east, and to see that everyone wants the same life we all take for granted. As for the issue of small children, while that was never mentioned in any articles I used for my paper, I am sure that some accommodation could be made, or barring that, another family member or neighbor or friend of the family could watch the children while the patient and spouse or companion are away. This is not a big deal, nor should it impede the implementation of medical tourism. C. The Family Medical Leave Act of 1993, signed into law by President Clinton requires covered employers to provide employees job-protected and unpaid leave for qualified medical and family reasons. Qualified medical and family reasons include: personal or family illness, family military leave, pregnancy, adoption, or the foster care placement of a child. While it does not include salary for the family member, even if an employee were to stay home and take care of an ill family member, they would lose their salary for that time period, but still have a job when the illness was over, or the employee could no longer stay home. As medical tourism is usually a planned event, the family could always make some provision to cut back certain expenses so that going abroad will not impose a financial burden on the family. Re: the statement that workers comp claimants are generally in lower-middle class–claimants are in a range of “classes” but they’re not treated differently based on their “class”. They don’t receive different medical care based on class. Evidenced based medical treatment guidelines are applied to all claimant/patients regardless of “class”. In workers comp, claimants don’t care how much medicals cost because they’re not responsible for the bill so their “class” is irrelevant – it’s “free medical care” for them. I never said that claimants are treated differently based on their class…That is not the point I was trying to make. I was trying to bolster the point made prior to that that medical tourism will benefit those without adequate health insurance coverage. I pointed out that lower-middle-class individuals will benefit most from medical tourism, and which is why I cited the study by Du and Leigh about claimants generally being lower-middle-class…yes, sometimes, the wealthy do file comp claims, but the bulk of claims I handled as an adjuster and as the Claims Administrator for a OCIP “Wrap-up” program in NY were with middle-class and lower-middle-class claimants, and many of the No-Fault claimants I handled were the same, and some were even immigrants. Finally, you are correct that medical guidelines apply to all. But I think that at some point, some claimants may come to accept medical tourism, especially if the insurer or employer has contracted for it as part of their health plan, or by sheer cost considerations. But if we ever tried to ship a claimant overseas for treatment, state laws governing would certainly prohibit this particularly noting that most states have specific requirements that providers be located within ‘X’ number of miles from a claimant’s home. Additionally, what about recovery, follow up care, complications, etc.? While some countries report on their quality standards, not all do and finding this information (much less establishing the validity of such data), is a daunting task. Not all facilities are going to opt to participate in Joint Commission accreditation because it is prohibitively expensive. Again, these state laws you mention here will need to be changed or modified. I did, however, bring up the fact that Oregon and Washington State allow claimants to choose doctors outside of the US, and even mentioned that Washington State has a page on their website with doctors in foreign countries the claimants can choose from. How different is that from the panels we looked at during my internship? If GA has a panel of six or so doctors and WA has a list of several doctors in countries around the world, is that any different, other than the fact that those doctors are overseas? As to recovery, follow-up and complications, recovery is covered in the basic medical tourism package. They don’t do the surgery and then fly you home saying “bye-bye”. They allow you to recover in the hospital in rooms that make US hospitals look like college dormitories. There are always going to be complications, whether here in the US or abroad, that cannot be helped, but given the fact that JCI is accrediting more and more hospitals, and nations becoming medical tourism destinations are eager to adopt international standards of quality, which is more than I can say for US based hospitals, which I also point out in the quality section. You say that not all facilities are going to opt to participate in JCI accreditation because of expense; however, those hospitals already accredited like Apollo Hospitals or Bumrungrad in Thailand, are already accredited, many are collaborating with US medical schools, and those that aren’t are either not going to be destinations, or will get help from those medical tourism experts such as a woman I know from the social media site I am a member of, and from a company that I learned of at the 5th World Medical Tourism & Global Healthcare Congress recently in Florida. Medical tourism doesn’t necessarily disproportionately benefit the under/uninsured. These people may not even have the financial means to travel away for care. I would hypothesize that people who are wealthy are much more likely to use services like this and yes, they would also make a vacation out of it. That may be true, but not all of the more than 500,000 Americans who have gone abroad for medical tourism are wealthy. And your hypothesis is not holding up to the fact that many Americans who have health insurance, but cannot get certain procedures performed here in the US or paid for by their insurance company, are going abroad, even if they are not wealthy as those who can afford it. Medical Tourism is for everyone. Expenses in the US are positively exorbitant. There are many other things that need to be done to control costs. Yes, and that is why I wrote the paper, to make it clear that this is one way to bring down costs. If you saw the chart I based my Introduction figures on from NCCI, you will see a clear twenty year upward trajectory of medical costs in comp, but so far, they have only managed to slow the rate of increase, not move the line down towards lower medical claim costs. Most of what the industry is trying to get a handle on, the re-packaging of drugs by physicians, opioid use abuse, better case management techniques, better software to monitor losses and experience mods, and the myriad other services offered by the workers’ compensation services industry have not, according to the annual NCCI State of the Line reports, moved the average medical cost per lost-time claims trend line down to a more manageable level. It currently is just below $30,000, so it is obvious that these measures are meager at best. One last point, medical tourism is not intended to take the place of primary care or treatment of workers’ comp injuries. That will, of course, happen in the days right after an injury occurs. Yes, that is true, but when surgery or treatment can be delayed, then one factor that will necessitate the implementation of medical tourism is the cost savings. The main point I wanted to make was that there is an alternative to high cost, post-primary treatment of certain work comp injuries such as knee, hip, or back surgery, or as Dr. Merrell points out, repetitive injuries such as carpal tunnel and the like. It is not for everything or for everyone, but it should be an option nonetheless. Does the risk of blood clot increase during a long flight? Of course, that’s why we have medications that substantially lower such risk. In addition when a person has surgery abroad, they cannot travel home immediately due to the risk of embolism. That’s why one must relax after surgery before returning home. The doctor in charge makes the determination concerning when it’s safe for the person to return home on a long flight… to help reduce the risk of such complication. I won’t know the doctor overseas. Before anyone goes abroad, they should at least get to know the doctor who will oversee their treatment, even if they are not physically there to do so. Long distance communication through Skype and other such resources are making the world smaller, so that is no longer an issue. I won’t know the people. If you are a patient in an American hospital, you’ll be lucky if you are even acquainted with any of the hospital staff. Normally the hospital staffs are people you don’t know. Of course patients who participate in medical tourism are encouraged to bring a travel companion, so the patient does know someone else. A travel companion lowers stress levels, which strengthens the healing process. Even when you factor in the cost of travel for two, you still save thousands of dollars. So how does this compare to hospitalization in the USA? Not much different, so obviously this too is a weak argument. As for your question concerning worker’s compensation, I am curious as to why an employer would want to limit such an advantage to worker’s compensation? As for workers’ compensation, I never said that employers would limit themselves to that for the advantage medical tourism offers them. My research showed that there are companies offering medical tourism as part of their health plans to individuals as well as employers. There have been issues with union objection and some state governments, particularly West Virginia, that have explored it, but have never passed bills to allow their workers to get medical treatment abroad. And when I attended the 5th World Medical Tourism & Global Healthcare Congress in October, I learned that large employers like American Express and Google, and smaller companies like Phillips Services Industries (PSI) are offering it as an option to their employees as part of their health care plans. Two individuals I connected with from the Congress are working on self-funded employer health care plans in Latin America with Aetna to offer medical tourism. A key challenge for those who advocate that medical tourism options be used for US based workers needing occupational injury treatment as well as those advocating that Medicare/Medicaid and other government systems pay for medical tourism options is the regulatory restrictions on those treatments and their reimbursements. In the case of US worker’s compensation programs, most states regulate both what insurers and employers can do to require or influence the care provider and site, as well as in many instances restrict the provider to an approved provider except for emergency treatments. As for the subject at hand, my paper was on the legal barriers to implementing medical tourism for WC. There were many legal barriers that I found, some of which seemed outdated given the ease of travel today in the US, and the ease of communication between doctors in one state and specialists in other states, especially at larger, more prestigious and better equipped hospitals. However, the three cases I cite in the paper, two on medical tourism to a foreign country (Mexico) and one on domestic medical tourism, opens the door slightly to allowing medical tourism for WC. The two cases concerned Mexican workers in CA and FL, respectively, who received treatment in their hometowns in Mexico, and the courts in both states, granted claimants petition to have Work Comp pay for it. FL law even recognizes that claimants will travel to their country to have care, so it was granted by the Supreme Court. It may take time, but there is no stopping the process of globalization, and that includes the globalization of medical care for Workers’ Compensation, because the costs will become so high here, that an alternative will have to be found, and that will break the dam, IMHO. See COUNTERPOINT 5 regarding Washington State and Oregon. No doubt what you say is true at the present time, but you should know, and I mention this in my paper, that medical costs of WC claims is rising, and as of the latest figures I got from NCCI, the average medical cost per lost time claim was $26,000 in 2008, and medical losses in 2008 represented 58% of all total losses. Given that, don’t you think there will come a time in the near future that insurance carriers will say ‘enough”, pressure legislatures to change laws and open the market to medical tourism to bring down costs? And as for choice of which facility is best, it would have to be one accredited by the international arm of the Joint Commission, such as Bumrungrad in Thailand, or those in India, Singapore, etc. I also think Americans need to be more globally aware that the rest of the world is not only catching up to us, but in many respects is passing us by. We can no longer hide our collective heads in the sand that the US is number one in everything, because it is not so. The doctors in these hospitals are trained in western medical schools, including US schools, and these schools are partnering with these hospitals. We are foolish and naive to think “America is No. 1”, and therefore we should not seek the best care wherever it may be. And as for leaving loved ones, these hospitals provide accommodations for loved ones or friends to stay with the patient until they have recovered enough to return home. It is a new world out there, and Americans must learn to embrace it, or we run the risk of becoming a third world nation ourselves. For workers compensation care, promotion of medical tourism as an option is a problem because most US worker’s compensation laws require that the employee have choice, or otherwise restrict the ability of insurers and others to restrict employee choice of care. Add to that, except for workers already working abroad, most workers don’t want to leave their families and communities for care and recovery in a foreign country where they don’t know the provider or the people. Existing worker’s compensation laws are not generally going to allow an insurer or employer to force an employee to go abroad for care because it’s cheaper. What regulatory restrictions don’t obstruct, these and other practical barriers likely will also limit the options. While there are many wonderful facilities around the world, most US based Americans are not sure how to tell which ones are top notch and which ones are not. While this already presents some challenges, the widely held skepticism of injured employees about the care provider choices of insurers and employers would generally go through the roof if the recommendation is made because the insurer or employer can get a cheaper rate by sending the worker oversees. Furthermore, while some Americans are willing to travel, most don’t want to leave their counties, much less their countries to get care unless they feel that the care provider is extraordinary or they have no other choice. In worker’s comp, employees have even more options to allow these and other concerns to control their care choices. 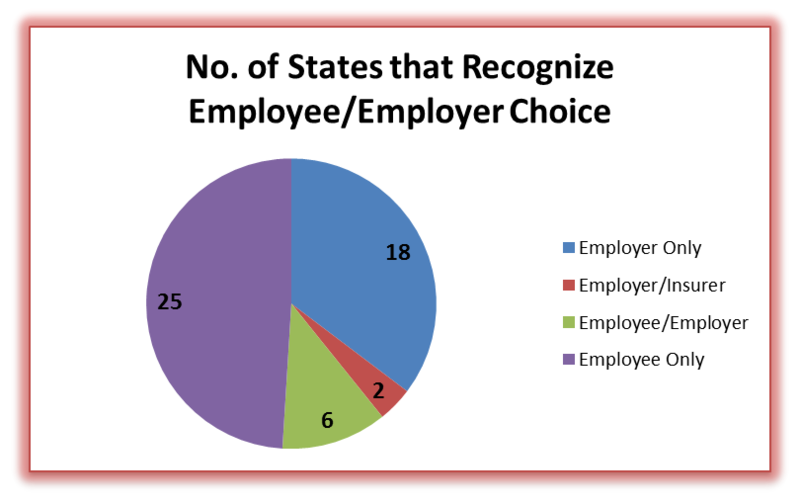 Actually, the truth is, the majority of states allow employers to decide choice of physician, in whole or in part, as the following graph shows. The difference lies in whether or not there is a medical provider network (MPN) or a health care organization (HCO), as in CA, or in those states that require an employee to choose from a panel of doctors selected by the state, or the employer. I am not saying that employers or insurers should force employees to choose medical tourism, but rather offer it as an option with the understanding that it will be more cost-effective and will be good for the employee and his recovery. Regulations can be changed, and since two states are already allowing employee choice abroad, shouldn’t that choice be made available for all workers? Medical tourism facilitators should be part of the conversation to implement medical tourism, as they are the ones who know the hospitals and the destinations that are best suited to handle the care and treatment of the patient. And yes, there will be many people who will not want to travel, but for those who would, especially those who are from some of the newer medical tourism destinations like the Latin American and Caribbean countries I saw at the Congress, it will be easier for them to be treated in a culture they understand and where the people speak their language. I am trying to lay out a possible scenario for the future of medical tourism and Workers’ Compensation. Do I have all the answers? NO, but I have some knowledge of both, and have a belief that all things are possible if people only apply themselves to finding the answers and setting out policies and procedures for this to happen. Maybe yes, or maybe no, but we have to try. Not trying is failure and that is worse than trying. Nothing is perfect, but to hide one’s head in the sand when there are alternatives that are better and more affordable is just plain silly. Obstacles can be overcome; they should not be written in stone that it cannot be done. Laws can be changed and rules can be put in place to make medical tourism work effectively through approved medical tourism facilitators recognized by the Workers’ Compensation Boards or Industrial Accident Commissions of states, and by the insurance carriers paying for the claims. Also, the employers, whose WC Experience Modification Factors (Mods) are determined by the frequency and/or severity of their claims, which impacts the premiums they pay for Comp insurance, have a stake in making sure the employee gets the best treatment for the lowest cost, because in the end, they will pay for it in the form of higher insurance premiums. Saving money should be paramount for any employer in this day and age, and if they want to do the right thing for themselves and their employees, medical tourism offers them the opportunity to do so. This entry was posted in Health Care, Medical Tourism, Workers' Compensation and tagged Health Care, Medical Tourism, Workers' Compensation on November 12, 2012 by Transforming Workers' Comp.